At the first of what organizers say will now be weekly Saturday rallies in front of the LAPD’s Central Division headquarters, a Skid Row rally on Saturday, organized by a homeless man, saw the largest public turnout yet for a public demand to end L.A’s massive new push to criminalize all this city’s homeless people. Activists are calling on the community to help set up a base-camp on Skid Row to halt, immediately now, the police attacks. Since last August, Los Angeles police have been the staging, on Skid Row, the largest attacks on homeless people in the city’s history; daily waves of police arrests, beatings and harassment that has terrorized all homeless people here: with up to 4,000 homeless people targeted. And with, up until now, almost no widespread Los Angeles city outcry. 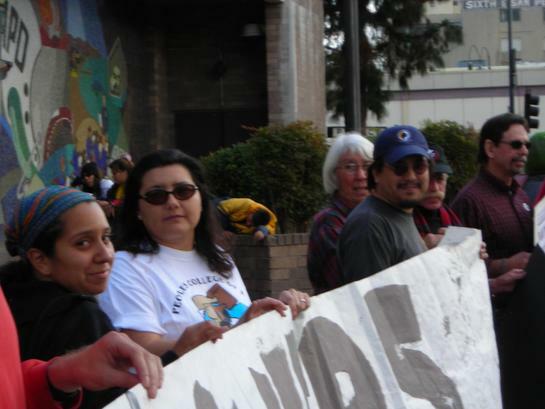 At this first of weekly rallies were activists from Food Not Bombs, the People’s College of Law, CopWatch Los Angeles, the Downtown Unitarian Universalists, and the Skid Row-based Catholic Worker community. Activists say they are now planning this week to establish a base camp on Skid Row --to intensify the community watch, and to assist homeless people here; and also other groups; in documenting the daily police attacks, as well as to support the upcoming weekly Saturday rallies. About 1,000 homeless people are holding out on Skid Row sidewalks now nightly –with another 3,000 throughout the L.A. area who are estimated to spend at least one night, every three months, living on Skid Row. “It is critical that from here on out no cop anywhere in this city get away with telling a homeless person anymore that they are a criminal because they refuse to go to a shelter. Don’t they get it? A Federal Court has ordered --as long as L.A., countywide, has over 80,000 homeless people and less than 30,000 shelterbeds you cannot humanely forbid anyone in here from sleeping wherever. This city has the worst housing crisis in the nation; but L.A. is now trying to enforce a new policy --‘shelter or criminalization.’ These attacks on homeless people are something that must end now; and the people of LA need to know that since last August, under our new, so-called “progressive” mayor, Antonio Villariagosa, homeless people are now being beaten, arrested, and criminalized --like has been done by no other mayor in Los Angeles’ history." stated the homeless organizer of the protest, David Busch. "Not even a Republican politician would have even dared attack us like this –and it is disgusting. Housing, not shelter, is a human right for all; and this trying to force us into accepting prison-like “shelters,” under threat of jail, or criminalization, must stop --now,” further stated Busch. Busch is homeless, and living on Skid Row, and has been attacked by cops there twice since August. He has been homeless for over 13 years. 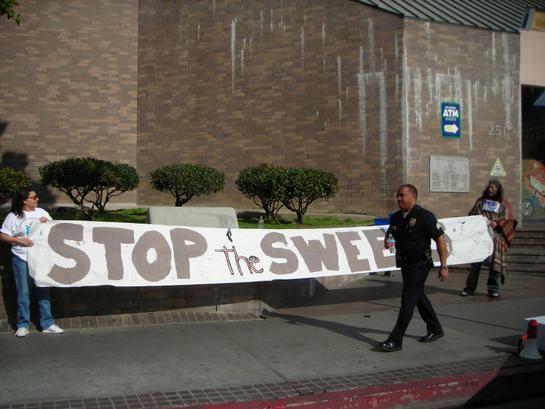 Activist say the waves of arrests and property seizures and beatings are coinciding with homeless being shipped by threat of force out of downtown; and away from many of the government offices and services they need –all in order to evacuate the poor from L.A.’s center for new loft and other pro-business developments downtown. LAPD Chief William Bratton, in the past, has linked the current sweeps as part of his “Broken Windows” policing policy for L.A..
Coinciding with the Saturday rally --the Los Angeles Coalition to End Hunger and Homelessness, a large city anti-poverty group –also though, on Thursday, issued a press release to every newspaper, radio and television station in Southern California, as well as to all major national news media, denouncing the sweeps; and demanding a full accounting from LAPD for every homeless person harassed by a cop since August. Eighty-percent of skid row is African American –and the largest percentage of the homeless on Skid Row, almost 10,000, are people forced to live in tiny one room hotels where they have had to pass constant drug screenings and cops have master keys, and where cops have been mounting unprecedented attacks on parolees also residing here to force them from the area. Meanwhile, this week, the Los Angeles City Council is also set to give continuing major green lights to a new, billion-dollar downtown mega-development, the “Grand Avenue Project”: and, along with the city ok, over 50 million dollars in taxpayer subsidies for the project. City Councilwoman for Skid Row, Jan Perry supports the Grand Avenue project –but is offering nothing comparable to help even those homeless on Skid Row who’ve scraped themselves up off the sidewalks, and clawed their way into these tiny hotel rooms. Homeless activists are calling for the community to show up en-mass for next Saturday’s rally, and to also pack tomorrow, Tuesday’s 9:30 a.m. Police Commission hearing at Parker Center; and to demand an end to all the attacks on the Skid Row community –as well as every Council meeting this week --and to also demand an immediate halt to the Grand Avenue Project, no matter what it takes, until community demands for equity for poor people downtown and throughout Los Angeles for the poor are meet by the developer consortium, and the L.A. City Council. Beginning of Rally Cop making donut run taunts demonstrators -- Central Division (Skid Row) is in the background.